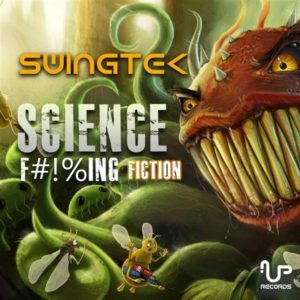 UP Records Australia is proud to present Science F#!%ing Fiction, the latest progressive psychedelic trance release from SwingTek, based in Cairns, Australia. SwingTek was founded in early 2013 by Joshua Balsdon and Angus Smith, both previously experienced in music production theory from their solo projects, AudioSpazm (Joshua) and Jangus Khan (Angus). The project, already has a number of successful hits under their belt with Ovnimoon Records (Chile), UP Records (Australia), Undervoice Records (Bolivia), and Twizted Lotus Records (Australia). This release is a gift to their audience, bringing some ground-breaking productions to the dance floor with an astounding mix of layers and textures beyond expectations at UP Records HQ. Mastered by Raz Kfir (Upgrade/RAZ, Israel). Graphic Design by Kyle Cook (KCDesigns, Australia). MP3 Download | FLAC Download | WAV Download · Download count: 11,002. Science F#!%ing Fiction in one word: nasa. we have some kind of space between the beats.. thanks!!! VERRYY GOOOOD !!!!! BIG KICK, BIG BASS.. AMAZING WORK!!! awesome release pls send some more of these genre of Psy trance. oh GOoD, it is able to even lift up the cloudy sky above Amsterdam! Thanks for releasing it in CCs..